A 100-acre nature camp was inaugurated by the Haryana Chief Minister Manohar Lal Khattar on June 10th as part of Global Wellness Day celebrations around the world. By August, it will be transformed into a very green weekend getaway destination. A beautiful eco-hub project is being set up in Bhondsi, in the Sohna tehsil, 10 kms outside of Sohna Road. 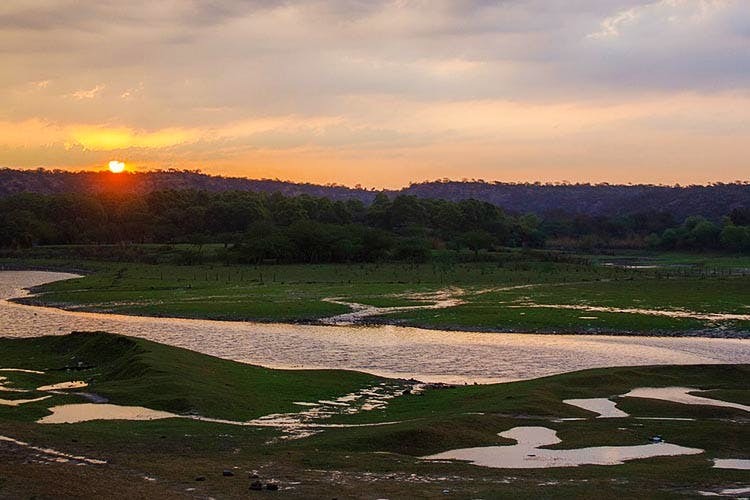 Located on the foothills of the Aravallis, the location has a thick jungle and a 15-acre natural lake. The Haryana Forestry Department, along with the State Government, has been working on this site for a few months now, trying to re-energise the area into a possible tourist hub, with 7 kilometre-long walking trails, an eco-lounge, a forestry museum and a herbal garden. From anyone with an inherent interest in going back to nature, to people in the city planning a weekend getaway to a quiet location, this will soon be a valid option. The first visitors, however, will be school children, and the department is working on establishing four nature camps for that purpose. The children will also be able to study botany and forestry in the interpretation centre that is being set up. There will also be tree houses, and tents, around the camps, creating a lovely atmosphere to imbibe an awareness of nature into students, early on. Bhondsi Camp, as it is called thus far, plans on opening its gates for the public in August. The Indira Gandhi Airport is around 23 kms away, while Gurgaon is only a stone’s throw away, making this the ideal location for a quick getaway from the noise and bustle of the city. We’ll keep you updated on the progress!